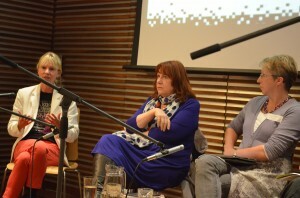 London’s Writing in a Digital Age Conference was a testament to the extraordinary human desire to write. LONDON: A new conference organized by the UK’s The Literary Consultancy (TLC) received a ringing endorsement from bestselling novelist Kate Mosse on its opening day in London earlier this month — even though Mosse herself tries to keep many of the developments it talked about at arm’s length. With a keynote address by novelist Hari Kunzru, in which he talked about “ontology extraction” and “computers already producing work that is something like literature,” as well as presentations from the creators of partly auto-generated SMS novels and people working at the crossover between games and stories, this was a conference that took delegates to the very edge of the known writing universe. Yet, curiously, it also reaffirmed many traditional truths, notably the need for plot, characters, story; the way text is transmitted and consumed may be changing, but readers’ needs are the same. In a session called “Authors Anonymous,” three writers – Kate Mosse, Orange Prize winning novelist Linda Grant and YA novelist Nicola Morgan, creator of the blog Help! I need a publisher! — talked about how they each used social media. Or not, in Mosse’s case. “When I write, I need peace in my head, I need quiet in my head,” said the author of the global bestseller Labyrinth. “Anything that takes me away from my desk, I don’t want. Your responsibility as a writer is first and foremost to the text. I accept that publishing is changing, but one of my resentments regarding things like Facebook and Twitter is that it’s an abdication of responsibility on the part of publishers. I do have a website, but I find it an enormous intrusion to update it – I would rather be in a bookshop meeting people. “I’m worried about the manipulation of us all through technology and I worry that we’re handing over power to companies that don’t necessarily have writers and readers at their heart. It’s about code and format, not about why we might read War and Peace or Mort d’Arthur. Yes, there are many changes in technology, but I don’t believe the human heart changes. The idea that we all have to engage in the same way now is erroneous. Eventually, he tired of this and decided to build himself a potential audience for his book by blogging and by painstakingly going through Amazon reviews of novels that he thought were similar to his, “finding their contact details and sending my book to them.” The result, as many know, is that his Mercury Falls series is among Amazon’s most successful self-published ventures – so much so that he has landed a ‘conventional’ publishing dial with Amazon Publishing’s new 47 North imprint. In fact, one of the most notable features of the conference was the warmth towards the online giant – in marked contrast to the feeling one has at industry-only events. Delegates here saw Amazon as an opportunity, not a threat. Thanks to Amazon, would-be authors, frustrated by what can seem like a forbidding, closed shop of publishers, are being given an opportunity to take things into their own hands – and increasing numbers are having success and causing traditional publishers to wake up and examine those Kindle self-published bestseller charts. 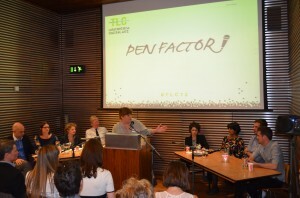 The conference concluded with the entertaining – and terrifying for the authors – Pen Factor, an X-Factor/Pop Idol-style bit of fun in which five writers made their pitches to two panels of agents and publishers. It was won by Nicholas Lim, an ex-editor at British indie Sheldrake Press, whose unashamedly commercial Crichton-esque thriller The Pattern Maker, which combines the world of deadly viruses with religious cults, was widely praised, particularly by Cathryn Summerhayes at William Morris. His is a name we may well hear again. DISCUSS: How Should the Frankfurt Book Fair Incorporate Self-Published Authors?